I have not posted a “Story Behind the Image” in a while, but after a few requests this reminded me it was time for a new one. New story, but of an oldie, one of my personal favorites. I included one of the images in the “Silhouettes” blog post from a while back, if you wish to check back for a couple of tips there. I then aligned myself for two things: to get the brightest and most vivid oranges into the frame, and then also to keep a few distractions that were poking up through the water out of the frame. Great Blue Heron, Canon 40D + 100-400L @400mm, aperture priority, evaluative metering, 1/1600s., f/7.1, ISO 400, 0 EC. Talk about luck having the heron hunting just at that opportune time. The heron spent about 10 minutes fishing from this very spot. 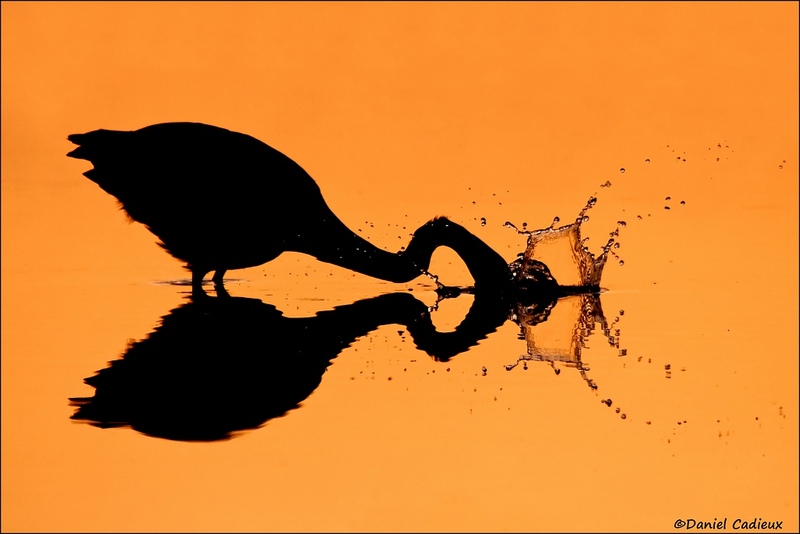 Every 30 seconds or so I would let off a sequence of images, timed with it striking of the water. Time of the bottom image is 6:24 AM, top image 6:26 AM. It was barely half an hour after sunrise and I felt like I had a day’s worth of great images to process. This shows the importance of getting to a location early – before the crowds and before the harsh light. Lots of birds are very active first thing in the morning too, so you get additional chances at cool action. Keen-eyed readers will note the use of Aperture Priority in the exif described under the images, which was the mode I preferred back then. If there is one thing I would change and highly suggest today is to go to full manual mode in a situation like this. Although AV worked well for me that time, going manual would ensure an exact same exposure for all frames taken during the encounter. Accidentally metering in a different spot while in Aperture Priority would have changed the exposure – not good. During post-processing, after converting the raw files into tifs, all that was to be done were small crops to help the compositions, deepen the blacks to get a solid shape out of the heron, add saturation to the oranges, and remove a few spots in the water that I felt were extraneous. In ending this blog post, I know which of the two images is my favorite…which one is yours? They are both amazing photos. 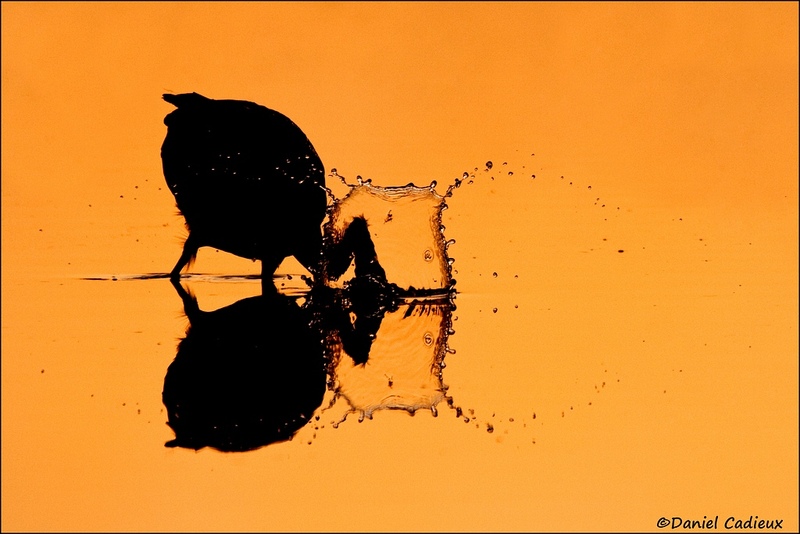 I like the bottom image best, the shape between the heron and its reflection in the water adds to an already amazing image. I prefer the top image, primarily because the splash pattern is beautifully rendered via the silhouette style, and it seems unlike other splash patterns. Both images are spectacular. Peter, thank you very much! Although I prefer the other, they are both pretty close. Glad you like them. Hi Artie, thanks for dropping by. I’ve flip flopped a few times on which I like best, but I do love the splash encircling the face in the first as well.